Over 20 years ago, we created our first low-flow spray valve to help conserve water, energy and money. Our team of design engineers continues to create industry-leading, water-efficient products. As the market continues to demand more green plumbing and foodservice fixture fittings, T&S will develop innovative solutions that meet the need. While low-flow technology is more important than ever, it is critical that equipment still maintain a sufficient level of performance — like fast, efficient cleaning times for pre-rinse units. 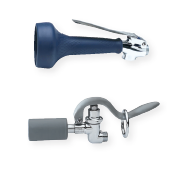 T&S pre-rinse spray valves pioneered water efficiency and conservation in the pre-rinse unit category. 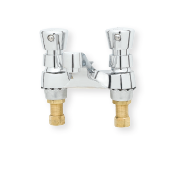 While LEED v4 flow rates are baselined at ≤ 1.3 GPM, the newest T&S pre-rinse spray valves are leagues ahead — offering 0.65 GPM and saving you up to 100,000 gallons per year. Saving as much as one gallon per hand wash, T&S electronic faucets are an ideal watersaving option for a variety of applications. 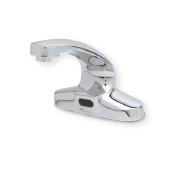 These smart faucets only turn on when a user’s hands are under the spout and flow at a predetermined low-flow rate. And now, with the Hydro-generator in place, you can save both water and energy. As one of three power options for T&S electronic faucets, the Hydro-generator harnesses the flow of water to generate enough electricity to power its next use. 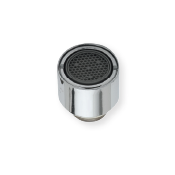 The perfect product to maximize water savings, T&S aerators provide flow control by restricting water usage to between 0.35 and 2.2 GPM. This range of flow rates allows operators to achieve proper levels for both conservation and regulatory requirements on new products and retrofits. Sometimes a small leak can be a big culprit in water consumption. 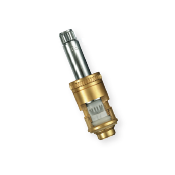 Our durable Cerama cartridges operate without seals or washers, eliminating most sources of a leak. Cut water usage by up to 20% and reduce or eliminate maintenance with a simple switch to T&S Cerama cartridges. T&S metering faucets significantly reduce water usage and save energy by regulating water flow and duration without using even the minimum amount of energy required by electronic faucets. Metering cartridges are preset for a 10 second flow time, but may be reset during installation. LEED tip: Duration and flow can significantly contribute to LEED v4 points in the Water Efficiency category.